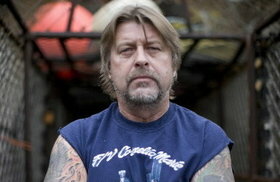 Captain Phil Harris of The Discovery Channel’s Deadliest Catch passed away today due to complications from a stroke he suffered on January 29, 2010. Statement from Discovery: Discovery mourns the loss of dear friend and colleague Captain Phil Harris. He was more than someone on our television screen. Phil was a devoted father and loyal friend to all who knew him. We will miss his straightforward honesty, wicked sense of humor and enormous heart. We share our tremendous sadness over this loss with the millions of viewers who followed Phil’s every move. We send our thoughts and prayers to Phil’s sons Josh and Jake and the Cornelia Marie crew. This entry was posted in Deadliest Catch, Phil Harris, Television. Bookmark the permalink.